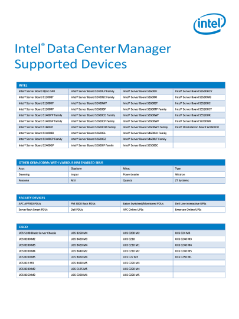 Guide: Intel® Data Center Manager supported servers list provides OEM/ODM-enabled SKUS, facility devices, and model numbers for vendors, including Inspur, Lenovo, HP, IBM, Cisco, Fujitsu, Dell, Huawei, NEC, SGI, Sugon, Supermicro, and Oracle Sun. See the benefits for saving energy and extending idle power with Intel® Data Center Manager. See how Intel® Data Center Manager ensures performance and stability of a system with real-time monitoring. Control costs with Intel® Data Center Manager by enabling real-time monitoring on existing infrastructure.